What exactly is this 12 days of cheer? Like I said the other day, if you're familiar with groupon, the 12 days of cheer is something like that. I'll be posting a new store each day and they will be offering a really sweet deal on one item from their shop! What will my savings be? Please keep in mind that all the shops participating are small businesses where all the items are handmade (minus a couple) but the discount can't be as amazing as 70% off like deals you sometimes see on groupon. The savings will be anywhere from 15% - 40% and there are limited amounts of each item available (anywhere from 10 - 30) so you may want to act quickly as the deal can potentially sell out. Just click the 'buy now' button and you will be able to purchase the deal directly from the post! 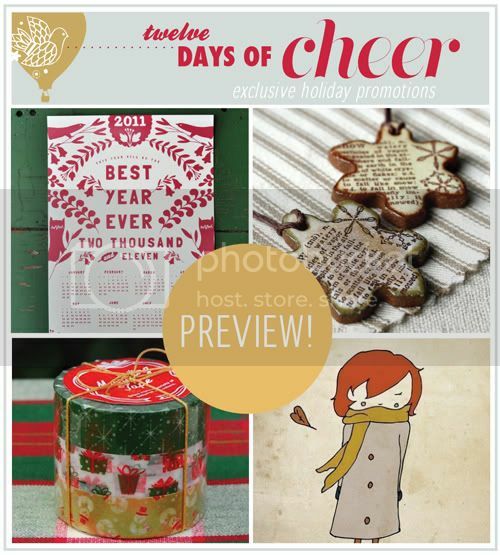 The funds are sent directly to the shop owner and your good cheer item will be sent off! Really easy & simple. Note: Shipping fees will be added at checkout for some shops - but don't worry, everything will be noted accordingly in each post. That's it! I hope it is simple and understandable. I know times are hard for some of you, financial situations for some of us are different than past years and I really wanted to get some fun deals going to bring to you and spread some good cheer. :) Who doesn't like a good deal? I am really excited for this promotion and I hope you will enjoy it and maybe score a couple good deals! I am really grateful for each of the shops participating, their generosity in discounting an item to offer is what makes the 12 days of cheer possible! If you have any questions about anything related to this promotion, please leave them in the comments below and I can update this information with more details if needed. Okay, so have your paypal accounts ready! Tomorrow will be the start of good cheer! The deal will be posted at 8:00 am Pacific Standard Time! Happy Tuesday, friends. This seems like a great idea! I'm excited! what a fantastic idea! i will definitely be keeping my eyes peeled and my paypal account at the ready. This is a fantastic idea! What a great way to offer a deal on what could be a one of a kind hand made gift! Not to mention a great way to get the makers of such lovely items a little more exposure. Everybody wins! ooh this sounds great, can't wait to see some lovely new sellers and exciting deals! :) thank you! wow this is sooo awesome danni!! you're always coming up with something new, you're such an innovator, i love it!!! Is it too late to say I'd like to be one of those shops offering cheer...? ?